1 piece clean cheesecloth or cotton linen, 6" X 6"
Place the broccoli, red radishes, carrots, cucumber and apple in layers in a 1 quart glass jar. Add the sauerkraut brine and place the sauerkraut on top. 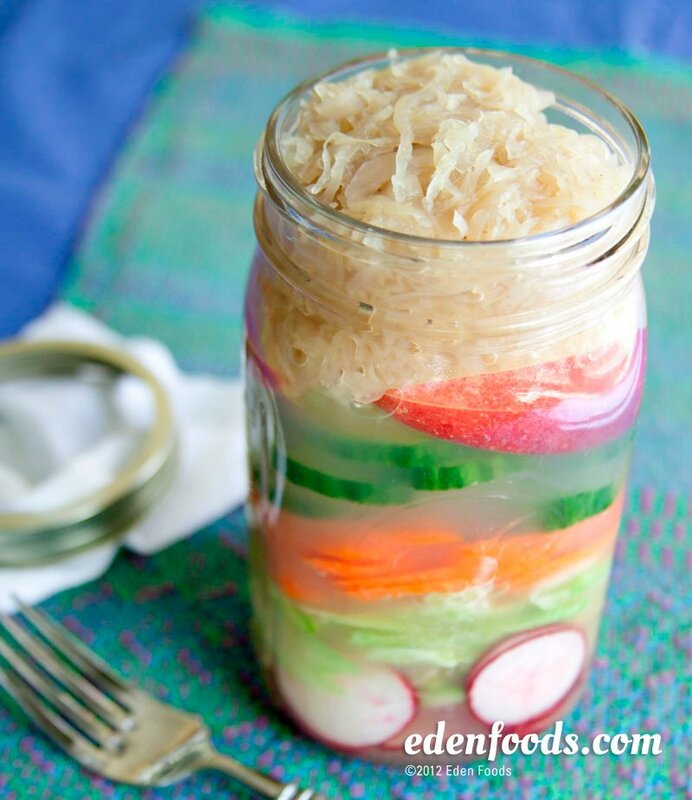 Push down on the sauerkraut to make sure the vegetables are covered with the sauerkraut juice. Place a piece of clean, cotton cheesecloth or linen over the mouth of the jar. Secure with an elastic band, string or metal jar ring. Let sit on the counter for 24 hours. Remove the cloth and place a cap securely on the jar. Refrigerate for 1 to 2 days. The pickles are now ready to eat. Remove only the portion you wish to eat for a meal, cap and refrigerate the remainder. Last 1 to 2 weeks refrigerated. Other vegetables that can be pickled in the same manner are: cauliflower, japanese daikon radish, white ice cycle radishes, rutabaga, turnips or try slices of apples or pears.